So it’s time for this blog to jump on the Thomas Piketty bandwagon, like everyone else. At the heart of his improbably bestselling book is the relationship between r, the return on assets (gold, shares, land etc), and g, the rate of economic growth. The idea is that if returns on assets accumulated in the past (and wealthier families would have more such assets) are higher than the rate at which current incomes are growing, than the inequality of wealth will increase. Those with more assets accumulate even more of it at a rate faster than that at which current incomes are growing. It’s a simple idea though not without its critics. Piketty’s book tracks the changing inequalities in wealth and incomes across a couple of hundred years for a number of countries. He makes the point that r has almost always exceeded g except for a period in the mid-20th century when it was the other way round – the result being a time when inequalities narrowed. But that phase has ended and we are once again living in a new gilded age. What about India? As opposed to wealth, Piketty analyses income inequality using income tax returns for India. Till the 1980s or so, the share of the top income earners in society, in total income national fell substantially, before rising again in the era of reform. But what about wealth inequality? Data on wealth in India is difficult to compile, and its pattern and distribution across time even more so. So I thought I would start from the other end by looking at returns on different classes of assets over time and compare that with GDP growth. The shifts in those returns over time is an indirect indicator of how wealth inequality has shifted over the last sixty years, assuming the Piketty relationship between r and g.
Even this way of doing it is hardly problem-free. The big issue is cataloguing the list of relevant assets. I went with the most obvious ones – savings deposits, equity shares and gold. The giant gap here is of course, land. There is simply no good indicator of land prices or rentals over time that can be used. To the extent that this data excludes land prices, it is flawed, so make of it what you will. All returns and growth rates in this chart are adjusted for inflation and are five-year moving averages. Now of course, the returns on these different assets move in different ways over time, so it’s difficult to make a generalization that holds right across. But to the extent that we can do so, look at the period beginning in the 1980s. First, the returns on equity became far more volatile, but at no time did they fall below the growth of GDP. Second, the 80s and 90s was the period when the great ‘bear’ phase in the gold market took place, driving down ‘returns’ on the staple investment of many Indian households, well below zero. It was also at this time, the GDP growth started to inch up, as did real returns on fixed deposits, after a prolonged phase in the 70s, when returns on it were negative. And while we don’t have data on land, it’s not a bad idea to assume that the 80s was a time when land prices really started to rise steeply, especially in large cities. The net effect depends on how households across the distribution held their wealth. If very rich households held a larger chunk of their assets in the form of land or equity than households a bit lower down, than wealth inequalities would have widened even more than they did in earlier decades. The 80s were a period of flux in the wealth distribution but I suspect that flux was limited to the higher end. Remember, even at this time, the vast majority of households in India would have had net wealth that was either zero or negative. And after the 2000s, wealth inequalities would have widened further, even though GDP growth expanded at a faster rate. This was simply because returns to gold grew much faster, and returns to equity rose much more sharply. India has not (yet) gone through the phase that many developed economies went through, when r fell below g. Going by historical experience, that is not going to happen till we are a much more ‘developed’ economy. * Or there is a massive ‘shock’ to the economy (e.g. war) which wipes out the value of capital. All data is from the Reserve Bank of India. Returns on equity are compiled from an RBI dataset of the financials of public limited companies. Gold prices and fixed deposit rates (3-5 year term) are from the RBIs statistical handbook. All prices and yields were adjusted for inflation using the GDP deflator calculated from RBI data. All data are five-year centred moving averages. Chart made using d3js. Chart tooltip code adapted from this example. *By ‘developed’, I dont just mean everyone is richer. It’s also a qualitative shift in, among other things, the ability of governments to extract resources, and revenue in the form of taxes. In that sense, the Indian state is actually not that ‘developed’. There has been much debate and discussion about the deep shifts that have happened in India’s labour market these last couple of decades. As workers leave agriculture, or newer and younger entrants into the workforce look for non-agricultural work, the key issue is the ability of sectors outside agriculture to absorb the influx.To the extent they cannot, workers are forced into the ‘informal’ sector – largely low-paying, small scale jobs with little security and no benefits, in industries such as retail trade (running or working in, shops) for instance. It should be pointed out here that 2011-12 has turned out to be a historic year for the Indian economy. It’s the first time that workers in agriculture were less than 50% of the workforce. It used to be that the biggest employer outside agriculture was the manufacturing sector*, and that is still the case. In addition, sectors such as trade and transport were a big absorber so to speak, of informal labour. But arguably the other big story in the last decade has been the emergence of one other sector as a huge repository of labour outside agriculture and that’s construction. 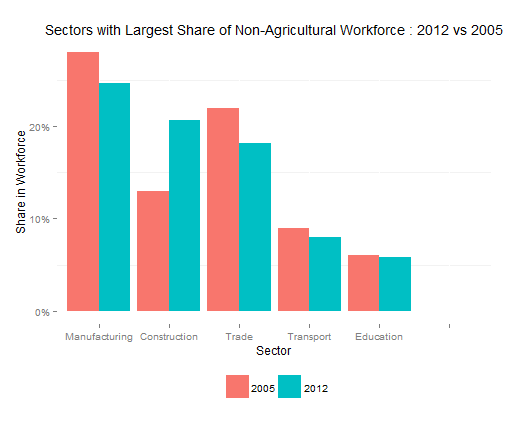 The chart below shows the extent to which construction is displacing other sectors as an employer outside agriculture – among the biggest employers, it was the only one between 2004-05 and 2011-2012 to increase its share of the non-agricultural workforce. It’s now second only to manufacturing, but has rapidly narrowed the gap. The emergence of the construction industry as a major employer is not just one of degree but of kind. The chart below is an interactive one which shows the breakdown of the workforce by gender, region (rural or urban), and conditions of work – whether a worker is salaried and whether he or she has any kind of social security (provident funds, pension, maternity benefits etc). The flowing vertical lines show how each of those ‘dimensions’ (gender, industry etc) are linked together. By hovering over each of the lines, you can figure out for instance, what number of rural males are employed in construction as casual labour. You can vertically reorder the dimensions to change the flow. For instance, hovering over ‘industry’ changes the mouse to a vertical arrow which you can drag up or down. You can open the chart in its own page by clicking here. The striking characteristic about the construction industry here is its big reliance on casual labour as opposed to the other categories of employment (‘self employment’ and ‘salaried’). A larger chunk of those employed in construction also tend to be those with no social security, even more so than manufacturing. To be sure, the overall NSS data shows an increase in the proportion of the salaried workforce as compared to other categories between 2005 and 2012. Whether that pattern continues in the future, will partly depend on whether (a) construction continues to expand at the pace it has done so in the last decade and (b) whether conditions of employment in that sector become more or less ‘informal’. In a previous post, we looked at voting patterns in one constituency in UP – Muzaffarnagar – which, in 2013, saw serious communal riots. The hypothesis was that the riots would polarise voting across the area. To see if this was true, we looked at the vote share of the biggest party (i.e. the one scoring the most votes) in each polling booth. What was apparent was that many,many booths across the constituency essentially turned into winner-take-all contests. In these booths, the largest party ended up with a very high vote share – often in excess of 90%. Whole villages or areas under a single booth chose to vote sharply one way or the other. This was in contrast to 2009, where the average booth saw a much more diverse pattern of voting behaviour. The map below essentially extends that analysis to the whole of UP. The darker areas saw more polarised voting, and the lighter areas saw less. What we see is a sharp difference between Western UP (where Muzaffarnagar is located), and the rest of the state. Voting in both central and Eastern UP was far less polarised than it was in the West. The white spaces on the map are those for which the data could not be compiled. This map needs some explanation of how it was constructed, so here goes. There are over 1.3 lakh data points underlying this map – one for each booth (but with gaps). I could have plotted each point on the map, coloured by the vote share of the largest party. This would have been overkill simply because multiple booths are located at one point (thus overlapping each other on a map). The problem was to aggregate data for booths in the same locality but without aggregating so much as to lose some of the complexity of voting patterns, even within a single constituency. The technique I used (explained in much greater detail here), was to overlay the map with a number of cells. These are the tiny hexagons you see on the map – just zoom in and they will be more visible. Each of these cells is exactly the same area. I look at the polling booths which fall within the bounds of each cell, and take the median of the vote shares of the largest parties in just those booths. Then we color the cell according to that median value – darker red for higher vote shares and lighter colors for lower vote shares. The grey lines are the actual boundaries of each of the 80 parliamentary constituencies in the state. The white areas you see on the map are those for which either the locations of polling booths werent available or for which data did not exist. You’ll also notice a number of points which fall outside the boundaries of the state – these are obviously incorrectly located, but I left them in anyway. This post owes a huge debt to Raphael Susewind who actually put the polling booth location data together and cleaned it up. * There are a couple of outliers in this map. The darker area in central UP is Rae Bareli, the stronghold of the Gandhi family. The lighter coloured area in Western UP is Sambhal, which saw distinctively lower polarised voting than other constituencies in the region. Then there are constituencies like Ghaziabad (to the left of Sambhal on the UP border) which saw both types of voting behaviour – some areas saw a pattern of sharply polarised voting, but other parts of the constituency didn’t. *The BJP won 71 of 80 seats in UP. It emerged strong across the state, irrespective of geographic location. What this map shows (and this is true of political parties in general I think), is that it had many different ways of winning. In context of an immediate election outcome this may not matter much (winning is winning, after all). But for journalists and researchers, exploring this idea of how a party won in different areas is, it seems to me, an idea very much worth exploring analytically and empirically. For those already tired of UP election data, and election analysis in general, my apologies. But I may do just one more piece on this idea of ‘ways of winning’. Here’s a version of the map which is also (a bit more) interactive. Caution : clicking on this, loads a 7 MB csv file, so you have been warned. It may take a minute or two to render, especially on a slow machine and/or internet connection. Mouse over a constituency to see details for that constituency. Unfortunately it’s also this part which is a bit buggy. Sometimes, the mouse over works, and sometimes it doesn’t, for some reason. I am trying to fix it. Maps rendered using D3, with colors from colorbrewer.